You may substitute Wheat Chex, other pretzel shapes, rye crisp rounds, goldfish crackers or Cheese Nips for any of the above. Pour over cereal mixture and stir well to coat. Bake in a 250* F oven for 1 hour, stirring every 15 minutes. 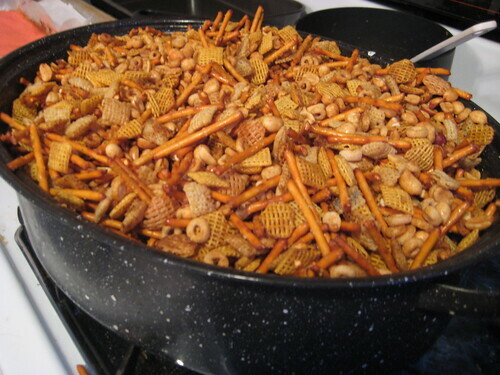 I always serve this with the cookies at our open house. The salty snack is a great balance to the sweet treats. This entry was written by ~~Rhonda, posted on December 14, 2009 at 2:39 pm, filed under Christmas, Recipes and tagged chex mix, recipe. Bookmark the permalink. Follow any comments here with the RSS feed for this post. Post a comment or leave a trackback: Trackback URL. Rhonda, I didn’t get back to you to thank you for the recipe for my friend, the cookies. We were surprised it was eggnog. We enjoyed your open house a lot. Also I saw your Village at Lana’s House this year Very pretty.